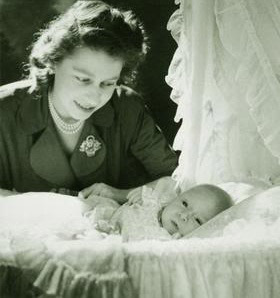 As Princess Elizabeth, the queen's jewelry collection was a largely personal one: mostly gifts from her wedding, birthday presents, and trinkets marking other significant events. Today's brooch is one such gem. 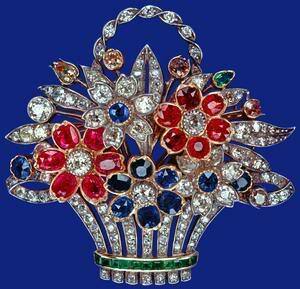 This brooch depicts a basket filled with ruby, diamond and sapphire flowers and was given to Princess Elizabeth by her parents, King George VI and Queen Elizabeth, to mark the birth of Prince Charles in November 1948. She wore it for the Charles' first official pictures about a month later, and she still wears it today. 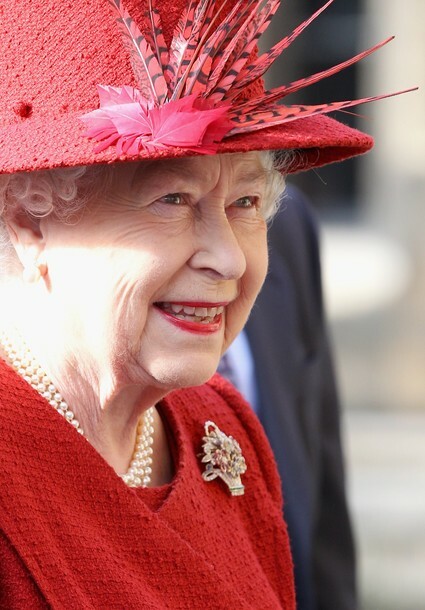 We've seen so far in our series that Queen Elizabeth has a tendency to match her colored stone brooches to her clothes in a rather literal fashion, but the many colors in this brooch make it game to be worn with a whole rainbow of outfits. I always think the success of these multicolored brooches comes down to what color you pin them on: when the color's just right, they are so vibrant, but when it's wrong, the colors just fall flat. This one's particularly good on red, don't you think?